For the Japanese band, see Penicillin (band). Penicillin (PCN or pen) is a group of antibiotics which include penicillin G (intravenous use), penicillin V (use by mouth), procaine penicillin, and benzathine penicillin (intramuscular use). Penicillin antibiotics were among the first medications to be effective against many bacterial infections caused by staphylococci and streptococci. They are still widely used today, though many types of bacteria have developed resistance following extensive use. About 10% of people report that they are allergic to penicillin; however, up to 90% of this group may not actually be allergic. Serious allergies only occur in about 0.03%. All penicillins are β-lactam antibiotics. Penicillin was discovered in 1928 by Scottish scientist Alexander Fleming. People began using it to treat infections in 1942. There are several enhanced penicillin families which are effective against additional bacteria; these include the antistaphylococcal penicillins, aminopenicillins and the antipseudomonal penicillins. They are derived from Penicillium fungi. The term "penicillin" is often used generically to refer to benzylpenicillin (penicillin G, the original penicillin found in 1928), procaine benzylpenicillin (procaine penicillin), benzathine benzylpenicillin (benzathine penicillin), and phenoxymethylpenicillin (penicillin V). Procaine penicillin and benzathine penicillin have the same antibacterial activity as benzylpenicillin but act for a longer period of time. Phenoxymethylpenicillin is less active against gram-negative bacteria than benzylpenicillin. Benzylpenicillin, procaine penicillin and benzathine penicillin can only be given by intravenous or intramuscular injections, but phenoxymethylpenicillin can be given by mouth because of its acidic stability. Common (≥ 1% of people) adverse drug reactions associated with use of the penicillins include diarrhoea, hypersensitivity, nausea, rash, neurotoxicity, urticaria, and superinfection (including candidiasis). Infrequent adverse effects (0.1–1% of people) include fever, vomiting, erythema, dermatitis, angioedema, seizures (especially in people with epilepsy), and pseudomembranous colitis. Penicillin can also induce serum sickness or a serum sickness-like reaction in some individuals. Serum sickness is a type III hypersensitivity reaction that occurs one to three weeks after exposure to drugs including penicillin. It is not a true drug allergy, because allergies are type I hypersensitivity reactions, but repeated exposure to the offending agent can result in an anaphylactic reaction. [medical citation needed] Allergy will occur in 1-10% of people, presenting as a skin rash after exposure. IgE mediated Anaphylaxis will occur in approximately 0.01% of patients. Penicillin G, benzylpenicillin IV or IM It has high urinary excretion and is produced as a salt of potassium or sodium. Penicillin V, phenoxymethylpenicillin By mouth It is less active than benzylpenicillin against Gram-negative bacteria. Benzathine benzylpenicillin, benzathine penicillin G IM Benzathine is a stabilizer that causes slower release over two to four weeks. Procaine benzylpenicillin, penicillin G procaine IM Slow release. Penicillin inhibits activity of enzymes that are needed for the cross linking of peptidoglycans in bacterial cell walls, which is the final step in cell wall biosynthesis. It does this by binding to penicillin binding proteins with the beta-lactam ring, a structure found on penicillin molecules. This causes the cell wall to weaken due to fewer cross links and means water uncontrollably flows into the cell because it cannot maintain the correct osmotic gradient. This results in cell lysis and death. Bacteria that attempt to grow and divide in the presence of penicillin fail to do so, and instead end up shedding their cell walls. Penicillin and other β-lactam antibiotics act by inhibiting penicillin-binding proteins, which normally catalyze cross-linking of bacterial cell walls. Bacteria constantly remodel their peptidoglycan cell walls, simultaneously building and breaking down portions of the cell wall as they grow and divide. β-Lactam antibiotics inhibit the formation of peptidoglycan cross-links in the bacterial cell wall; this is achieved through binding of the four-membered β-lactam ring of penicillin to the enzyme DD-transpeptidase. As a consequence, DD-transpeptidase cannot catalyze formation of these cross-links, and an imbalance between cell wall production and degradation develops, causing the cell to rapidly die. The enzymes that hydrolyze the peptidoglycan cross-links continue to function, even while those that form such cross-links do not. This weakens the cell wall of the bacterium, and osmotic pressure becomes increasingly uncompensated—eventually causing cell death (cytolysis). In addition, the build-up of peptidoglycan precursors triggers the activation of bacterial cell wall hydrolases and autolysins, which further digest the cell wall's peptidoglycans. The small size of the penicillins increases their potency, by allowing them to penetrate the entire depth of the cell wall. This is in contrast to the glycopeptide antibiotics vancomycin and teicoplanin, which are both much larger than the penicillins. Gram-positive bacteria are called protoplasts when they lose their cell walls. Gram-negative bacteria do not lose their cell walls completely and are called spheroplasts after treatment with penicillin. Penicillin shows a synergistic effect with aminoglycosides, since the inhibition of peptidoglycan synthesis allows aminoglycosides to penetrate the bacterial cell wall more easily, allowing their disruption of bacterial protein synthesis within the cell. This results in a lowered MBC for susceptible organisms. Penicillins, like other β-lactam antibiotics, block not only the division of bacteria, including cyanobacteria, but also the division of cyanelles, the photosynthetic organelles of the glaucophytes, and the division of chloroplasts of bryophytes. In contrast, they have no effect on the plastids of the highly developed vascular plants. This supports the endosymbiotic theory of the evolution of plastid division in land plants. The chemical structure of penicillin is triggered with a very precise, pH-dependent directed mechanism, effected by a unique spatial assembly of molecular components, which can activate by protonation. It can travel through bodily fluids, targeting and inactivating enzymes responsible for cell-wall synthesis in gram-positive bacteria, meanwhile avoiding the surrounding non-targets. Penicillin can protect itself from spontaneous hydrolysis in the body in its anionic form, while storing its potential as a strong acylating agent, activated only upon approach to the target transpeptidase enzyme and protonated in the active centre. This targeted protonation neutralizes the carboxylic acid moiety, which is weakening of the β-lactam ring N–C(=O) bond, resulting in a self-activation. Specific structural requirements are equated to constructing the perfect mouse trap for catching targeted prey. Penicillin has low protein binding in plasma, the bioavailability of penicillin depends on the type; penicillin G has a low bioavailability, below 30%, whereas penicillin V has a higher bioavailability between 60 and 70%. Penicillin has a short half life and is excreted via the kidneys. The term "penam" is used to describe the common core skeleton of a member of the penicillins. This core has the molecular formula R-C9H11N2O4S, where R is the variable side chain that differentiates the penicillins from one another. The penam core has a molar mass of 243 g/mol, with larger penicillins having molar mass near 450—for example, cloxacillin has a molar mass of 436 g/mol. The key structural feature of the penicillins is the four-membered β-lactam ring; this structural moiety is essential for penicillin's antibacterial activity. The β-lactam ring is itself fused to a five-membered thiazolidine ring. The fusion of these two rings causes the β-lactam ring to be more reactive than monocyclic β-lactams because the two fused rings distort the β-lactam amide bond and therefore remove the resonance stabilisation normally found in these chemical bonds. 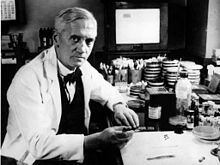 Alexander Fleming, who is credited with discovering penicillin in 1928. Starting in the late 19th century there had been many accounts by scientists and physicians on the antibacterial properties of the different types of moulds including the mould penicillium but they were unable to discern what process was causing the effect. The effects of penicillium mould would finally be isolated in 1928 by Scottish scientist Alexander Fleming, in work that seems to have been independent of those earlier observations. Fleming recounted that the date of his discovery of penicillin was on the morning of Friday 28 September 1928. The traditional version of this story describes the discovery as a serendipitous accident: in his laboratory in the basement of St Mary's Hospital in London (now part of Imperial College), Fleming noticed a Petri dish containing Staphylococci that had been mistakenly left open was contaminated by blue-green mould from an open window, which formed a visible growth. There was a halo of inhibited bacterial growth around the mould. Fleming concluded that the mould released a substance that repressed the growth and caused lysing of the bacteria. Once Fleming made his discovery he grew a pure culture and discovered it was a Penicillium mould, now known as Penicillium chrysogenum. Fleming coined the term "penicillin" to describe the filtrate of a broth culture of the Penicillium mould. Fleming asked C. J. La Touche to help identify the mould, which he incorrectly identified as Penicillium rubrum (later corrected by Charles Thom). He expressed initial optimism that penicillin would be a useful disinfectant, because of its high potency and minimal toxicity in comparison to antiseptics of the day, and noted its laboratory value in the isolation of Bacillus influenzae (now called Haemophilus influenzae). Fleming was a famously poor communicator and orator, which meant his findings were not initially given much attention. He was unable to convince a chemist to help him extract and stabilize the antibacterial compound found in the broth filtrate. Despite this, he remained interested in the potential use of penicillin and presented a paper entitled "A Medium for the Isolation of Pfeiffer's Bacillus" to the Medical Research Club of London, which was met with little interest and even less enthusiasm by his peers. 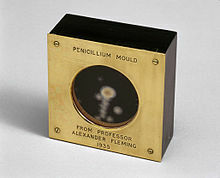 Had Fleming been more successful at making other scientists interested in his work, penicillin for medicinal use would possibly have been developed years earlier. Despite the lack of interest of his fellow scientists, he did conduct several experiments on the antibiotic substance he discovered. The most important result proved it was nontoxic in humans by first performing toxicity tests in animals and then on humans. His subsequent experiments on penicillin's response to heat and pH allowed Fleming to increase the stability of the compound. The one test that modern scientists would find missing from his work was the test of penicillin on an infected animal, the results of which would likely have sparked great interest in penicillin and sped its development by almost a decade. The importance of his work has been recognized by the placement of an International Historic Chemical Landmark at the Alexander Fleming Laboratory Museum in London on November 19, 1999. 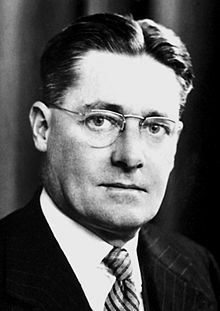 Florey (pictured), Fleming and Chain shared a Nobel Prize in 1945 for their work on penicillin. In 1930, Cecil George Paine, a pathologist at the Royal Infirmary in Sheffield, attempted to use penicillin to treat sycosis barbae, eruptions in beard follicles, but was unsuccessful. Moving on to ophthalmia neonatorum, a gonococcal infection in infants, he achieved the first recorded cure with penicillin, on November 25, 1930. He then cured four additional patients (one adult and three infants) of eye infections, and failed to cure a fifth. In 1939, Australian scientist Howard Florey (later Baron Florey) and a team of researchers (Ernst Boris Chain, Edward Abraham, Arthur Duncan Gardner, Norman Heatley, Margaret Jennings, J. Orr-Ewing and G. Sanders) at the Sir William Dunn School of Pathology, University of Oxford made progress in showing the in vivo bactericidal action of penicillin. In 1940, they showed that penicillin effectively cured bacterial infection in mice. In 1941, they treated a policeman, Albert Alexander, with a severe face infection; his condition improved, but then supplies of penicillin ran out and he died. Subsequently, several other patients were treated successfully. In December 1942, survivors of the Cocoanut Grove fire in Boston were the first burn patients to be successfully treated with penicillin. By late 1940, the Oxford team under Howard Florey had devised a method of mass-producing the drug, but yields remained low. In 1941, Florey and Heatley travelled to the US in order to interest pharmaceutical companies in producing the drug and inform them about their process. Florey and Chain shared the 1945 Nobel Prize in Medicine with Fleming for their work. The challenge of mass-producing this drug was daunting. On March 14, 1942, the first patient was treated for streptococcal septicemia with US-made penicillin produced by Merck & Co. Half of the total supply produced at the time was used on that one patient, Anne Miller. By June 1942, just enough US penicillin was available to treat ten patients. In July 1943, the War Production Board drew up a plan for the mass distribution of penicillin stocks to Allied troops fighting in Europe. The results of fermentation research on corn steep liquor at the Northern Regional Research Laboratory at Peoria, Illinois, allowed the United States to produce 2.3 million doses in time for the invasion of Normandy in the spring of 1944. After a worldwide search in 1943, a mouldy cantaloupe in a Peoria, Illinois market was found to contain the best strain of mould for production using the corn steep liquor process. Pfizer scientist Jasper H. Kane suggested using a deep-tank fermentation method for producing large quantities of pharmaceutical-grade penicillin. Large-scale production resulted from the development of a deep-tank fermentation plant by chemical engineer Margaret Hutchinson Rousseau. As a direct result of the war and the War Production Board, by June 1945, over 646 billion units per year were being produced. Penicillin was being mass-produced in 1944. G. Raymond Rettew made a significant contribution to the American war effort by his techniques to produce commercial quantities of penicillin. During World War II, penicillin made a major difference in the number of deaths and amputations caused by infected wounds among Allied forces, saving an estimated 12%–15% of lives. Availability was severely limited, however, by the difficulty of manufacturing large quantities of penicillin and by the rapid renal clearance of the drug, necessitating frequent dosing. Methods for mass production of penicillin were patented by Andrew Jackson Moyer in 1945. Florey had not patented penicillin, having been advised by Sir Henry Dale that doing so would be unethical. After World War II, Australia was the first country to make the drug available for civilian use. In the U.S., penicillin was made available to the general public on March 15, 1945. Dorothy Hodgkin determined the chemical structure of penicillin. 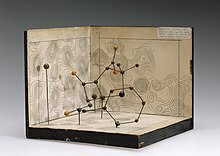 Dorothy Hodgkin's model of penicillin's structure. The chemical structure of penicillin was first proposed by Edward Abraham in 1942 and was later confirmed in 1945 using X-ray crystallography by Dorothy Crowfoot Hodgkin, who was also working at Oxford. She later received the Nobel prize for this and other structure determinations. Chemist John C. Sheehan at the Massachusetts Institute of Technology (MIT) completed the first chemical synthesis of penicillin in 1957. Sheehan had started his studies into penicillin synthesis in 1948, and during these investigations developed new methods for the synthesis of peptides, as well as new protecting groups—groups that mask the reactivity of certain functional groups. Although the initial synthesis developed by Sheehan was not appropriate for mass production of penicillins, one of the intermediate compounds in Sheehan's synthesis was 6-aminopenicillanic acid (6-APA), the nucleus of penicillin. [page needed] Attaching different groups to the 6-APA 'nucleus' of penicillin allowed the creation of new forms of penicillin. The narrow range of treatable diseases or "spectrum of activity" of the penicillins, along with the poor activity of the orally active phenoxymethylpenicillin, led to the search for derivatives of penicillin that could treat a wider range of infections. The isolation of 6-APA, the nucleus of penicillin, allowed for the preparation of semisynthetic penicillins, with various improvements over benzylpenicillin (bioavailability, spectrum, stability, tolerance). The first major development was ampicillin in 1961. It offered a broader spectrum of activity than either of the original penicillins. Further development yielded β-lactamase-resistant penicillins, including flucloxacillin, dicloxacillin, and methicillin. These were significant for their activity against β-lactamase-producing bacterial species, but were ineffective against the methicillin-resistant Staphylococcus aureus (MRSA) strains that subsequently emerged. Another development of the line of true penicillins was the antipseudomonal penicillins, such as carbenicillin, ticarcillin, and piperacillin, useful for their activity against Gram-negative bacteria. However, the usefulness of the β-lactam ring was such that related antibiotics, including the mecillinams, the carbapenems and, most important, the cephalosporins, still retain it at the center of their structures. 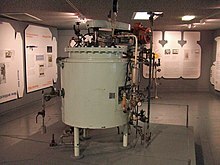 A 1957 fermentor (bioreactor) used to grow Penicillium mould. Penicillin is a secondary metabolite of certain species of Penicillium and is produced when growth of the fungus is inhibited by stress. It is not produced during active growth. Production is also limited by feedback in the synthesis pathway of penicillin. The by-product, l-lysine, inhibits the production of homocitrate, so the presence of exogenous lysine should be avoided in penicillin production. The biotechnological method of directed evolution has been applied to produce by mutation a large number of Penicillium strains. 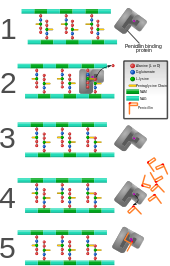 These techniques include error-prone PCR, DNA shuffling, ITCHY, and strand-overlap PCR. Semisynthetic penicillins are prepared starting from the penicillin nucleus 6-APA. Overall, there are three main and important steps to the biosynthesis of penicillin G (benzylpenicillin). The first step is the condensation of three amino acids—L-α-aminoadipic acid, L-cysteine, L-valine into a tripeptide. Before condensing into the tripeptide, the amino acid L-valine must undergo epimerization to become D-valine. The condensed tripeptide is named δ-(L-α-aminoadipyl)-L-cysteine-D-valine (ACV). The condensation reaction and epimerization are both catalyzed by the enzyme δ-(L-α-aminoadipyl)-L-cysteine-D-valine synthetase (ACVS), a nonribosomal peptide synthetase or NRPS. The second step in the biosynthesis of penicillin G is the oxidative conversion of linear ACV into the bicyclic intermediate isopenicillin N by isopenicillin N synthase (IPNS), which is encoded by the gene pcbC. Isopenicillin N is a very weak intermediate, because it does not show strong antibiotic activity. The final step is a transamidation by isopenicillin N N-acyltransferase, in which the α-aminoadipyl side-chain of isopenicillin N is removed and exchanged for a phenylacetyl side-chain. This reaction is encoded by the gene penDE, which is unique in the process of obtaining penicillins. ^ Walling AD (September 15, 2006). "Tips from Other Journals – Antibiotic Use During Pregnancy and Lactation". American Family Physician. 74 (6): 1035. Retrieved September 25, 2015. ^ "Discovery and Development of Penicillin". American Chemical Society. Retrieved 30 August 2015. ^ Oxford Handbook of Infectious Diseases and Microbiology. OUP Oxford. 2009. p. 56. ISBN 978-0-19-103962-1. 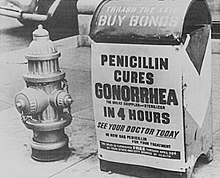 ^ "penicillin" – via The Free Dictionary. ^ Garrod LP (February 1960). "Relative antibacterial activity of three penicillins". British Medical Journal. 1 (5172): 527–9. doi:10.1136/bmj.1.5172.527. PMC 1966560. PMID 13826674. ^ Garrod LP (December 1960). "The relative antibacterial activity of four penicillins". British Medical Journal. 2 (5214): 1695–6. doi:10.1136/bmj.2.5214.1695. PMC 2098302. PMID 13703756. ^ "Penicillin G and Penicillin V". livertox.nih.gov. Retrieved 2016-09-25. ^ "Penicillin (Benzylpenicillin, Penicillin G, Bicillin C-R/L-A, Pfizerpen, Wycellin)". The Antimicrobial Index. Knowledgebase. Retrieved 4 March 2014. ^ "Penicillin G sodium salt Susceptibilty and Resistance Data" (PDF). TOKU-E. Retrieved 4 March 2014. ^ a b c Rossi S, ed. (2006). Australian Medicines Handbook. Adelaide: Australian Medicines Handbook. ISBN 978-0-9757919-2-9. ^ a b Hitchings A, Lonsdale D, Burrage D, Baker E (2015). Top 100 drugs : clinical pharmacology and practical prescribing. pp. 174–181. ISBN 978-0-7020-5516-4. ^ Yocum RR, Rasmussen JR, Strominger JL (May 1980). "The mechanism of action of penicillin. 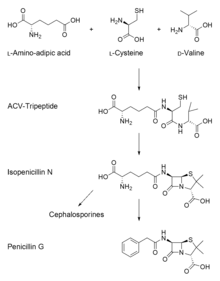 Penicillin acylates the active site of Bacillus stearothermophilus D-alanine carboxypeptidase". The Journal of Biological Chemistry. 255 (9): 3977–86. PMID 7372662. ^ "Benzylpenicillin". www.drugbank.ca. Retrieved 22 January 2019. ^ Van Bambeke F, Lambert D, Mingeot-Leclercq M, Tulkens P (1999). Mechanism of Action (PDF). ^ Winstanley TG, Hastings JG (February 1989). "Penicillin-aminoglycoside synergy and post-antibiotic effect for enterococci". The Journal of Antimicrobial Chemotherapy. 23 (2): 189–99. doi:10.1093/jac/23.2.189. PMID 2708179. ^ Kasten B, Reski R (March 30, 1997). "β-lactam antibiotics inhibit chloroplast division in a moss (Physcomitrella patens) but not in tomato (Lycopersicon esculentum)". Journal of Plant Physiology. 150 (1–2): 137–140. doi:10.1016/S0176-1617(97)80193-9. ^ Mucsi Z, Chass GA, Ábrányi-Balogh P, Jójárt B, Fang DC, Ramirez-Cuesta AJ, Viskolcz B, Csizmadia IG (December 2013). "Penicillin's catalytic mechanism revealed by inelastic neutrons and quantum chemical theory". Physical Chemistry Chemical Physics. 15 (47): 20447–55. Bibcode:2013PCCP...1520447M. doi:10.1039/c3cp50868d. PMID 23760063. ^ Levison ME, Levison JH (December 2009). "Pharmacokinetics and pharmacodynamics of antibacterial agents". Infectious Disease Clinics of North America. 23 (4): 791–815, vii. doi:10.1016/j.idc.2009.06.008. PMC 3675903. PMID 19909885. ^ Haven KF (1994). Marvels of Science : 50 Fascinating 5-Minute Reads. Littleton, CO: Libraries Unlimited. p. 182. ISBN 978-1-56308-159-0. ^ a b c d e Lax E (2004). The Mold in Dr. Florey's Coat: The Story of the Penicillin Miracle. Holt Paperbacks. ISBN 978-0-8050-7778-0. ^ Bud R (2009). Penicillin: Triumph and Tragedy. Oxford University Press. ISBN 978-0-19-954161-4. ^ a b Krylov AK (1929). "[Gastroenterologic aspects of the clinical picture of internal diseases]". Terapevticheskii Arkhiv. 63 (2): 139–41. PMC 2048009. PMID 2048009. Reprinted in Fleming A (2001). "On the antibacterial action of cultures of a penicillium, with special reference to their use in the isolation of B. influenzae. 1929". Bulletin of the World Health Organization. 79 (8): 780–90. PMC 2566493. PMID 11545337. ^ "Discovery and Development of Penicillin". International Historic Chemical Landmarks. American Chemical Society. Retrieved August 21, 2018. ^ Wainwright M, Swan HT (January 1986). "C.G. Paine and the earliest surviving clinical records of penicillin therapy". Medical History. 30 (1): 42–56. doi:10.1017/S0025727300045026. PMC 1139580. PMID 3511336. ^ Howie J (July 1986). "Penicillin: 1929-40". British Medical Journal. 293 (6540): 158–9. doi:10.1136/bmj.293.6540.158. PMC 1340901. PMID 3089435. ^ Wainwright M (January 1987). "The history of the therapeutic use of crude penicillin". Medical History. 31 (1): 41–50. doi:10.1017/s0025727300046305. PMC 1139683. PMID 3543562. ^ a b Jones DS, Jones JH (2014-12-01). "Sir Edward Penley Abraham CBE. 10 June 1913 – 9 May 1999". Biographical Memoirs of Fellows of the Royal Society. 60: 5–22. doi:10.1098/rsbm.2014.0002. ISSN 0080-4606. ^ "Ernst B. Chain – Nobel Lecture: The Chemical Structure of the Penicillins". www.nobelprize.org. Retrieved 2017-05-10. ^ Clark R (1985). The Life of Ernst Chain: Penicillin and Beyond. ^ "Animal Experiments: Further Views". The New York Times. 1992-05-24. Retrieved 2014-10-11. ^ a b c d "Making Penicillin Possible: Norman Heatley Remembers". ScienceWatch. Thomson Scientific. 2007. Archived from the original on February 21, 2007. Retrieved 2007-02-13. ^ Levy SB (2002). The Antibiotic Paradox: How the Misuse of Antibiotics Destroys Their Curative Powers. Da Capo Press. pp. 5–7. ISBN 978-0-7382-0440-6. ^ Grossman CM (July 2008). "The first use of penicillin in the United States". Annals of Internal Medicine. 149 (2): 135–6. doi:10.7326/0003-4819-149-2-200807150-00009. PMID 18626052. ^ Rothman, Lily (14 March 2016). "Penicillin history: what happened to first American patient". Time. Retrieved 12 March 2019. ^ Mailer JS, Mason B. "Penicillin : Medicine's Wartime Wonder Drug and Its Production at Peoria, Illinois". lib.niu.edu. Retrieved February 11, 2008. ^ a b Parascandola J (1980). The History of antibiotics: a symposium. American Institute of the History of Pharmacy No. 5. ISBN 978-0-931292-08-8. ^ Bellis M. "The History of Penicillin". Inventors. About.com. Retrieved October 30, 2007. ^ Lehrer S (2006). Explorers of the Body: Dramatic Breakthroughs in Medicine from Ancient Times to Modern Science (2nd ed.). New York: iUniverse. pp. 329–330. ISBN 978-0-595-40731-6. ^ Greenwood D (2008). Antimicrobial Drugs: Chronicle of a Twentieth Century Medical Triumph. Oxford: Oxford University Press. p. 109. ISBN 978-0-19-953484-5. ^ Madhavan G (Aug 20, 2015). Think Like an Engineer. Oneworld Publications. pp. 83–85, 91–93. ISBN 978-1-78074-637-1. Retrieved 20 November 2016. ^ "ExplorePAhistory.com". Retrieved May 11, 2009. ^ Andrew Jackson Moyer, Method for Production of Penicillin, United States Patent Office, US Patent 2,442,141, filed 11 May 1945, issued 25 March 1948. ^ Andrew Jackson Moyer, Method for Production of Penicillin, United States Patent Office, US Patent 2,443,989, filed 11 May 1945, issued 22 June 1948. ^ Andrew Jackson Moyer, Method for Production of Penicillin, United States Patent Office, US Patent 2,476,107, filed 11 May 1945, issued 12 July 1949. ^ a b Silverthorn DU (2004). Human physiology: an integrated approach (3rd ed.). Upper Saddle River (NJ): Pearson Education. ISBN 978-0-8053-5957-2. ^ "Discovery and development of penicillin". American Chemical Society. 1999. ^ The Nobel Prize in Chemistry 1964, Perspectives. Retrieved July 14, 2012. ^ Sheehan JC, H enery-Logan KR (March 5, 1957). "The Total Synthesis of Penicillin V". Journal of the American Chemical Society. 79 (5): 1262–1263. doi:10.1021/ja01562a063. ^ Sheehan JC, Henery-Loganm KR (June 20, 1959). "The Total Synthesis of Penicillin V". Journal of the American Chemical Society. 81 (12): 3089–3094. doi:10.1021/ja01521a044. ^ a b c Corey EJ, Roberts JD. "Biographical Memoirs: John Clark Sheehan". The National Academy Press. Retrieved January 28, 2013. ^ Nicolaou KC, Vourloumis D, Winssinger N, Baran PS (January 2000). "The Art and Science of Total Synthesis at the Dawn of the Twenty-First Century". Angewandte Chemie. 39 (1): 44–122. doi:10.1002/(SICI)1521-3773(20000103)39:1<44::AID-ANIE44>3.0.CO;2-L. PMID 10649349. ^ "Professor John C. Sheehan Dies at 76". MIT News. April 1, 1992. Retrieved January 28, 2013. ^ Sheehan JC (1982). The Enchanted Ring: The Untold Story of Penicillin. MIT Press. ISBN 978-0-262-19204-0. ^ Colley EW, Mcnicol MW, Bracken PM (March 1965). "Methicillin-Resistant Staphylococci in a General Hospital". Lancet. 1 (7385): 595–7. doi:10.1016/S0140-6736(65)91165-7. PMID 14250094. ^ James CW, Gurk-Turner C (January 2001). "Cross-reactivity of beta-lactam antibiotics". Proceedings. 14 (1): 106–7. PMC 1291320. PMID 16369597. ^ a b c Al-Abdallah Q, Brakhage AA, Gehrke A, Plattner H, Sprote P, Tuncher A (2004). "Regulation of Penicillin Biosynthesis in Filamentous Fungi". In Brakhage AA (ed.). Molecular Biotechnology of Fungal beta-Lactam Antibiotics and Related Peptide Synthetases. Advances in Biochemical Engineering/Biotechnology. 88. pp. 45–90. doi:10.1007/b99257. ISBN 978-3-540-22032-9. ^ a b Brakhage AA (September 1998). "Molecular regulation of beta-lactam biosynthesis in filamentous fungi". Microbiology and Molecular Biology Reviews. 62 (3): 547–85. PMC 98925. PMID 9729600. ^ Schofield CJ, Baldwin JE, Byford MF, Clifton I, Hajdu J, Hensgens C, Roach P (December 1997). "Proteins of the penicillin biosynthesis pathway". Current Opinion in Structural Biology. 7 (6): 857–64. doi:10.1016/s0959-440x(97)80158-3. PMID 9434907. ^ a b Martín JF, Gutiérrez S, Fernández FJ, Velasco J, Fierro F, Marcos AT, Kosalkova K (September 1994). "Expression of genes and processing of enzymes for the biosynthesis of penicillins and cephalosporins". Antonie van Leeuwenhoek. 65 (3): 227–43. doi:10.1007/BF00871951. PMID 7847890. Nicolaou KC, Corey EJ (1996). Classics in Total Synthesis : Targets, Strategies, Methods (5. repr. ed.). Weinheim: VCH. ISBN 978-3-527-29284-4. Dürckheimer W, Blumbach J, Lattrell R, Scheunemann KH (March 1, 1985). "Recent Developments in the Field of β-Lactam Antibiotics". Angewandte Chemie International Edition in English. 24 (3): 180–202. doi:10.1002/anie.198501801. Hamed RB, Gomez-Castellanos JR, Henry L, Ducho C, McDonough MA, Schofield CJ (January 2013). "The enzymes of β-lactam biosynthesis". Natural Product Reports. 30 (1): 21–107. doi:10.1039/c2np20065a. PMID 23135477. Wikimedia Commons has media related to Penicillin antibiotics. The Discovery of Penicillin, A government produced film about the discovery of Penicillin by Sir Alexander Fleming, and the continuing development of its use as an antibiotic by Howard Florey and Ernst Boris Chain on YouTube.